Parmesan cheese, or Parmigiano Reggiano, is one of the Italy’s most famous cheeses, with the production process remaining unchanged for centuries – nine centuries, in fact. Parmigiano Reggiano is now officially classed as a PDO (Protected Designation of Origin) product by the European Union, therefore it can only be legally produced in the regions of Parma, Reggio Emilia, Modena and parts of Mantua and Bologna. 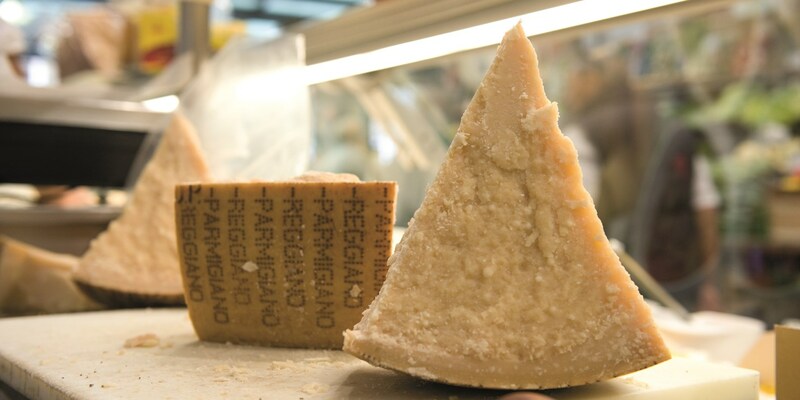 Parmesan is a hard, aged cheese, and regulations state it must be matured for a minimum of twelve months. The cheese is at its best if left to mature for a full twenty-four months, although the most distinctive, nutty flavours can only be achieved after thirty months maturation. It is this dedication to traditional processes, using only the highest quality ingredients, that ensures the most superior crumbly, hard parmesan is produced. This collection of Parmesan recipes celebrates the versatility of this distinctive, nutty cheese. Parmesan can be used as a fantastic flavour enhancer when sprinkled over salads, blitzed into pesto or melted into a creamy risotto, as seen in the Costardi Brothers’ Asparagus and carnaroli risotto recipe. Pasta and Parmesan, too, is a much-loved pairing; Aurora Mazzucchelli uses parmesan as a flavourful filling for her Tortelli with Parmesan, lavender, nutmeg and almond recipe, whereas the Cerea Brothers weave parmesan through their tomato sauce and use it to garnish their traditional Paccheri pasta dish. Of course, while Parmesan is a popular addition to many meat-free dishes the use of animal rennet during the production process means it is not strictly vegetarian. Many vegetarians choose to overlook this technicality (as with wine and beer), but if you are cooking for a guest for the first time it is worth checking beforehand to see what they’d prefer.